Lipo XS: Is it Safe? Lipo XS is a diet pill that promises substantial weight loss courtesy of several popular ingredients that are incorporated into its system. According to their website, by reducing unwanted body fat, cutting down on hunger cravings, increasing energy, and ceasing the production of new fat cells the consumer will not only lose weight but regain their confidence too. Of course all of this sounds very nice but does Lipo XS really work? Luckily our team of nutrition researchers are fully invested in keeping our finger on the pulse of the weight loss nutrition supplement world, investigating new products and properly ranking them according to 1) the company behind the product, 2) the science and clinical results of the product, and lastly 3) what actual customers are saying about it. So with this criteria in mind, let’s take a closer look at Lipo XS! 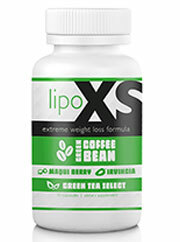 Lipo XS contains green coffee bean extract, green tea extract, maqui berry extract, irvingia gabonensis, caffeine anhydrous (aka the powdered version of regular caffeine), and coenzyme Q10. Firstly, it is clear this product relies heavily on stimulants. Green coffee bean extract, caffeine anhydrous, and green tea extract are all notoriously loaded with caffeine. Please do not be fooled, just because one of the ingredients actually says “caffeine” does not mean it’s the only stimulant in the product. Many ingredients also contain caffeine, and green coffee bean extract and green tea extract are two examples. By pumping a diet pill full of caffeine, although this may have an effect on the consumer’s appetite and resistance to fatigue, overloading on the stimulant also comes with a whole slew of side effects such as jitteriness, nausea, headache, dizziness, insomnia, and many, many others. Moreover, if a dieter merely wants to lose weight by way of ingesting a whole lot of caffeine, in our opinion they’d be better off adding two or three cups of black coffee to their daily intake seeing as that is essentially what they are doing by taking green tea extract, caffeine anyhdrous, and green coffee bean extract. Plus, we do not know how much of each ingredient is even in the product! Nowhere on the website could we find any listing of the ingredient proportions - just the ingredients themselves. This is concerning simply because consumers should always know the exact amounts of what is in a supplement before taking it. High doses of anything can potentially lead to severe side effects whereas low doses, inversely, could render a product ineffective and ultimately just a waste of money. Insofar as Lipo XS goes: we just do not know how much or how little of the aforementioned ingredients are this product! Secondly, the product claims to incorporate an effective fat burner, Irvingia Gabonensis. However, a quick check on WebMD went to show that the promise of this ingredient for weight loss is of poor research quality, requires a low-calorie diet, and thus ultimately boils down to “insufficient evidence” of effectiveness according to the reputable site. Moreover, Irvingia Gabonensis has been known to lower blood sugar levels, a dangerous side effect for people with diabetes. And lastly, our team could not find a company behind this product! Their website is decently put together but contains no link or section about the people who produce the product! Additionally although our team was able to locate some customer reviews, they are few and far between, and strangely overly positive. Moreover, there were very few negative reviews and little overall talk about the product on the whole aside from what is said on their own website. This too is cause for suspicion. Although Lipo XS does have some nice marketing and an attractive price, ultimately this product does not disclose nearly enough information to convince us of its effectiveness. In our opinion, a proper diet pill needs to disclose the company from which it originates, the amounts of the ingredients it uses, and have plenty of third party customer reviews surrounding it. Unfortunately Lipo XS fails on all three fronts and we simply cannot recommend it. Bottom Line: Lipo XS offers up plenty of promises but very little evidence as to why we should believe them. "It helped with hunger but made me really shaky and nervous. I think I need to consult with my physician before continuing taking it!." Just bought three bottles, will keep you updated about my results! I have tried this for 2 weeks and it seems like it makes me really hungry. I feel like I need to constantly eat something. So I have stopped taking this product.